Monday, December 22, 2014 through Saturday, January 3, 2015-Las Vegas Nevada: Kit and I hope everyone had a Merry Christmas and are enjoying the happiest of New Years! Warning: The following material may be graphic in the overabundance of cute kids doing the cute things…..viewer discretion is advised. This is the second Excellent Adventure trip in a row that we have been in able to spend the holidays with our youngest daughter and her family. 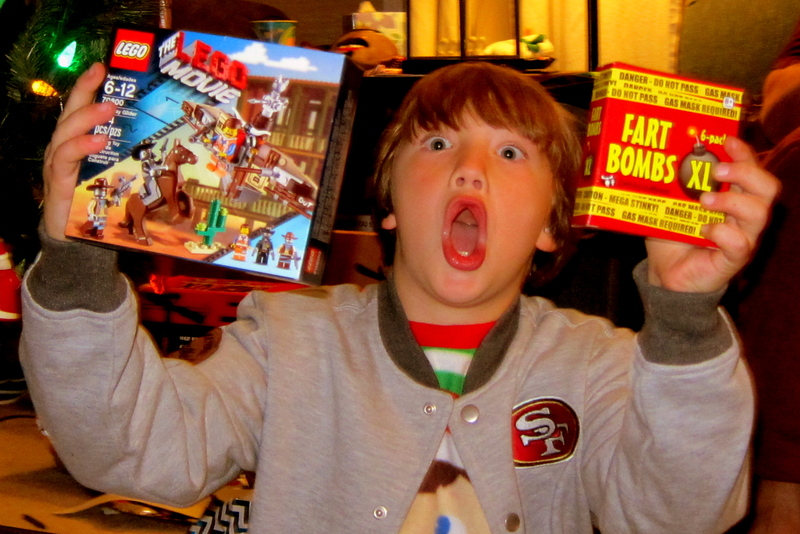 There is nothing like enjoying the Christmas spirit with kids that truly believe! 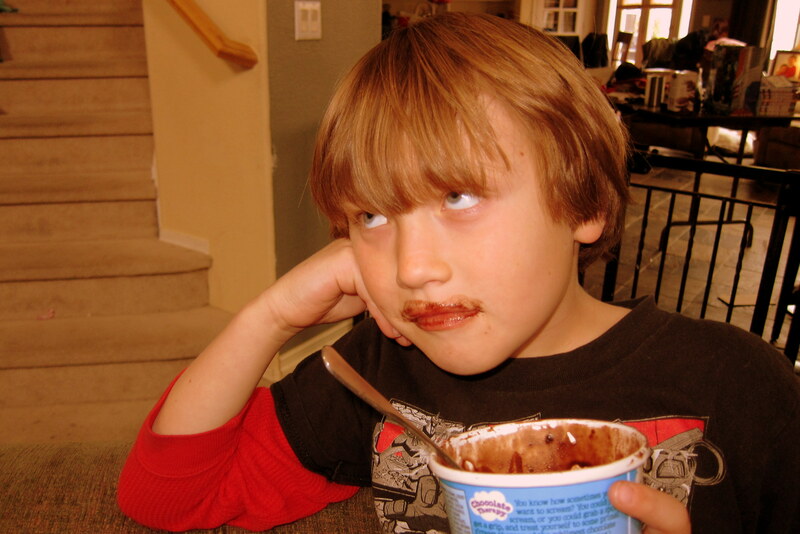 …..and Tucker age 7 1/2. Yep, they once again spent a few days with us in the camper which is idle at Oasis RV Park and a short distance from their Las Vegas home. This allowed Kit and I ample grandkid time while providing mom and dad a reprieve to enjoy a getaway. This year we were introduced to a new Christmas tradition…..“The Elf on the Shelf”, which we renamed “The Scamp in the Camp”. 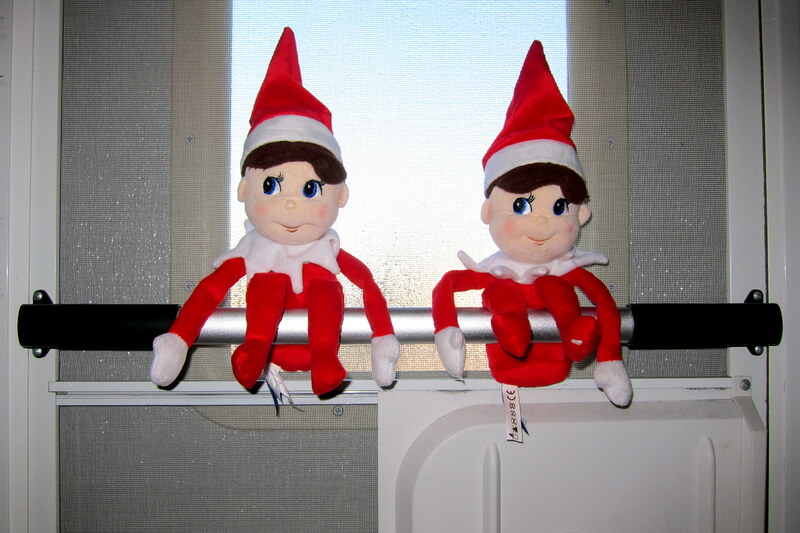 These little elves found various observation positions in and around the camper to keep an eye on everything. 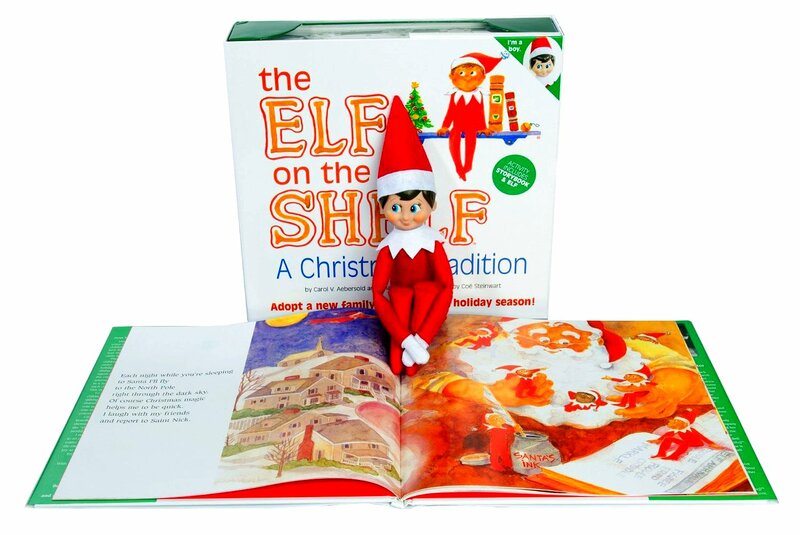 The Elf on the Shelf is a children’s picture book written and self-published by Carol Aebersold and her daughter a few years ago. It has since become a wildly popular folk character and a part of many families Christmas tradition. As the story goes, Santa employs a team of Christmas Elves to visit children’s homes and listen to what the girls and boys desire for Christmas. And, to really see who is naughty or nice…..it’s kinda like what the NSA does for grownups but without the gifts. 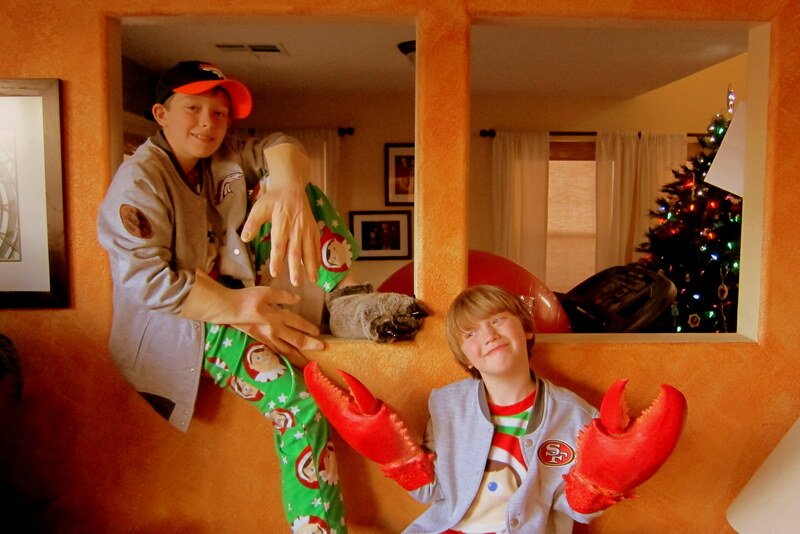 Christmas morning, Kit and I arose very early and made our way to the home of Jack and Tucker. They had been anxiously awaiting our arrival and the official start of the Christmas morning chaos. 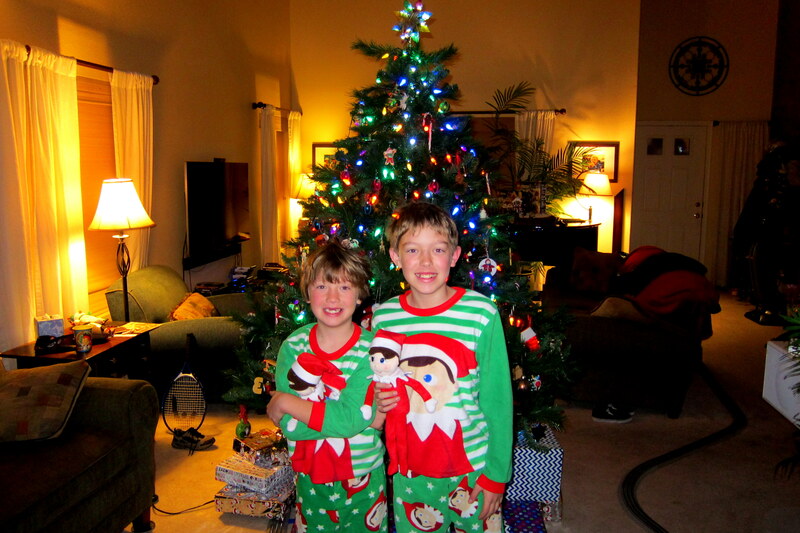 Santa was very good to Jack and Tucker…..they must have been very good in 2014. In addition there were gifts from the family including these perennial favorites that Aunt Kim sent from Maine. 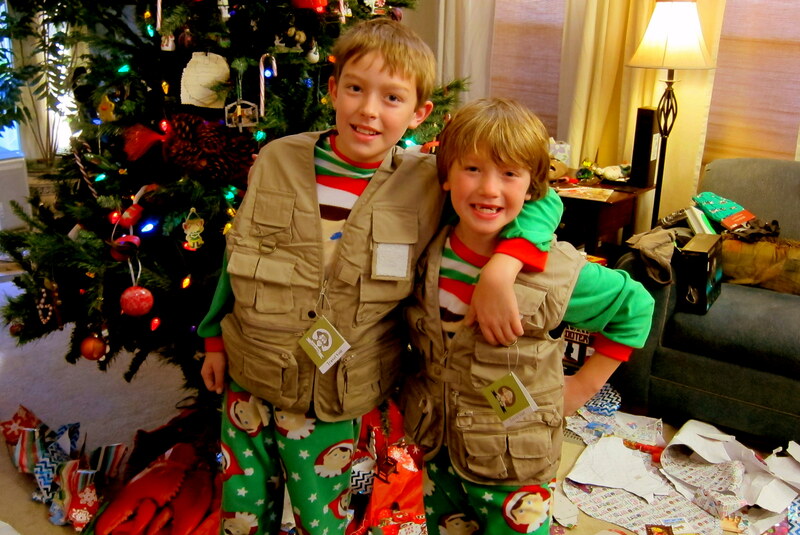 And these nifty traveling vests provided by Kit and I, which they rapidly filled with numerous treasures. As the chaos subsided, we sat down to a non-traditional Christmas meal. 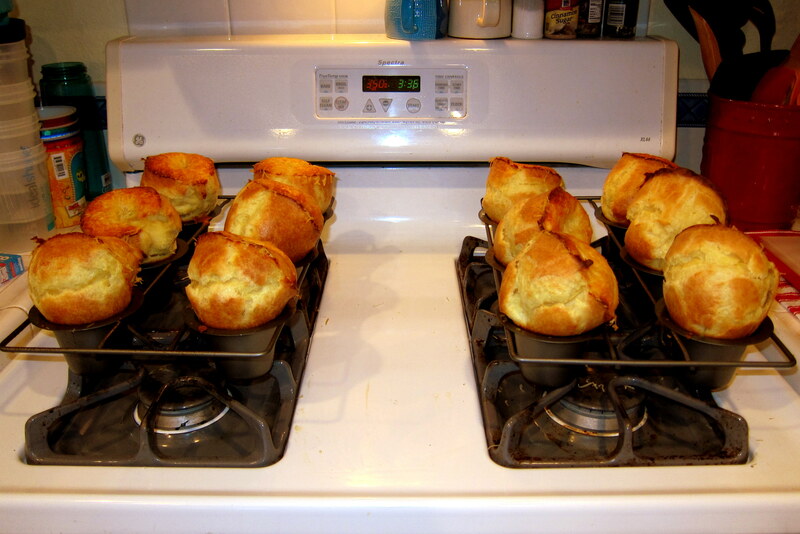 Everyone preselects one entrée to contribute…..mine was spicy Buffalo wings and Kit’s choice was homemade popovers. 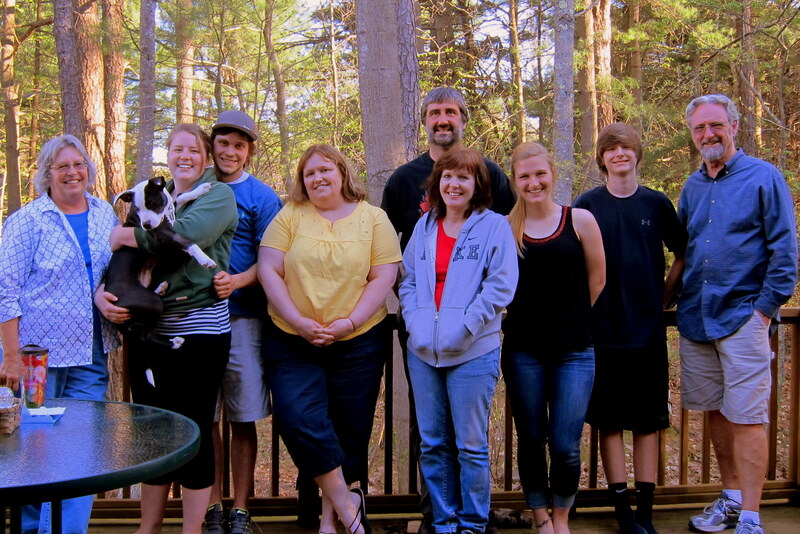 Everything was excellent and we enjoyed a great family dinner. The rest of the afternoon was spent visiting and watching Jack and Tucker enjoy their presents. 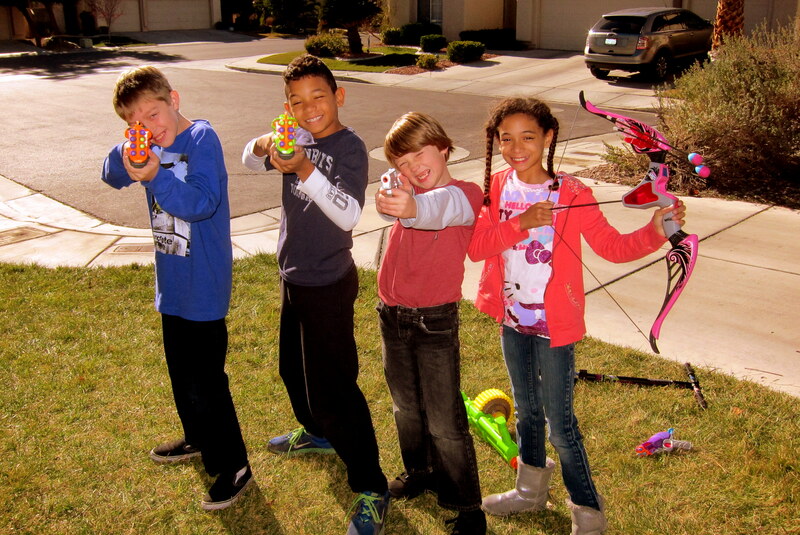 Soon, the neighborhood kids were at the door…..seems that Nerf Guns were a popular gift this year. Foam missiles were flying everywhere! 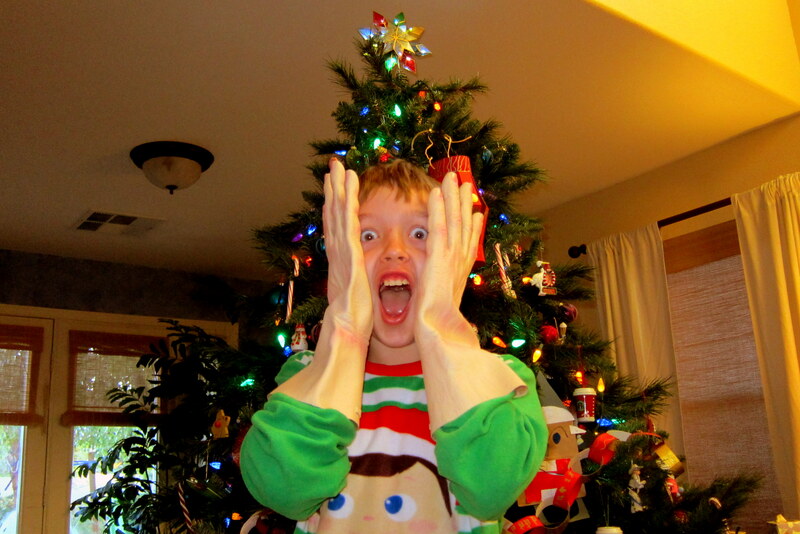 All too soon, Christmas day came to a close for another year much to the chagrin of Jack. ….. 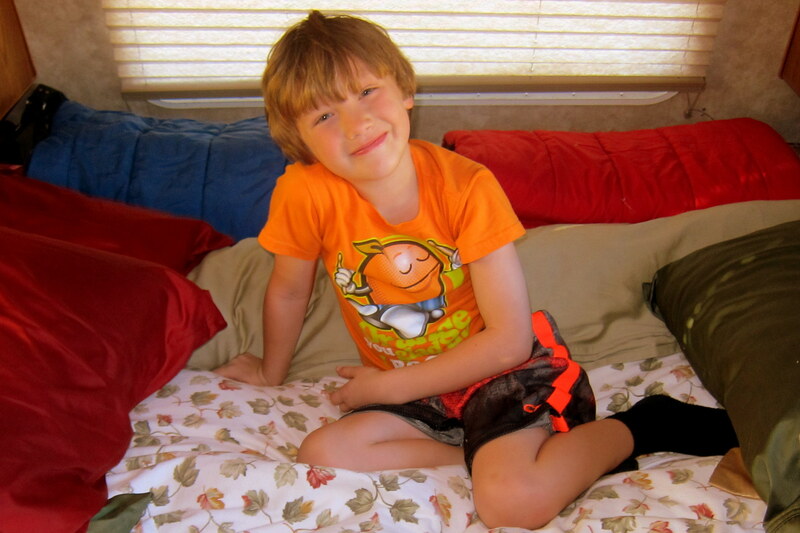 Kit and I returned to our little camper at the RV Park. 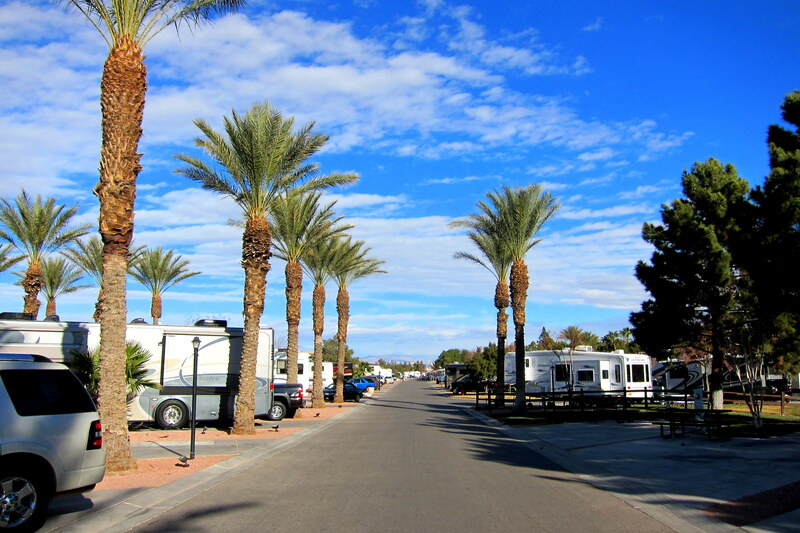 Oasis RV Resort is just south of the strip and directly off Las Vegas Boulevard. It is a bit pricey, and not really our favorite style of campground…..however, it is very convenient and well-appointed featuring a well-stocked store, natural grass mini golf course and a café. 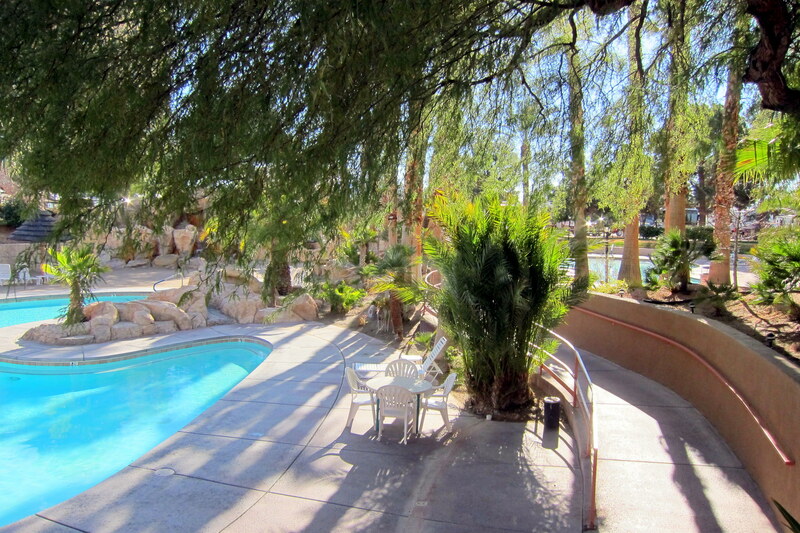 In addition, there are two pools, a large hot tub and a well-appointed exercise room. 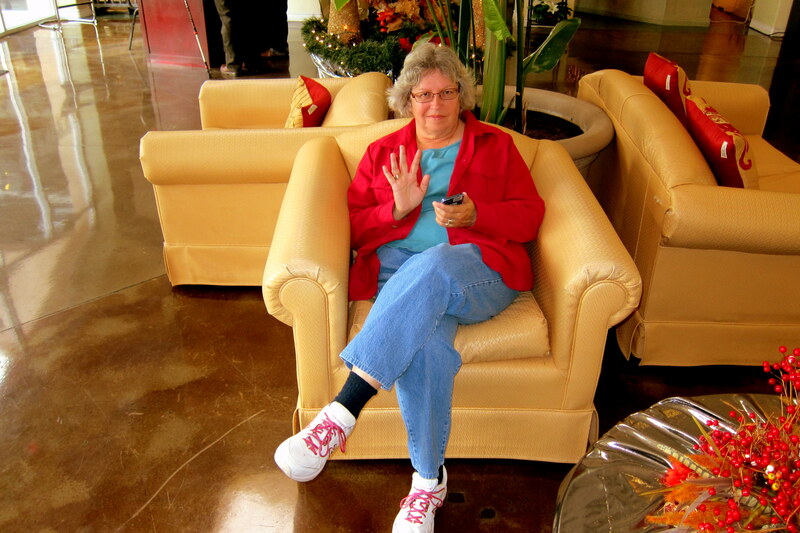 And then there is Kit’s favorite feature…..comfy chairs in the lobby. 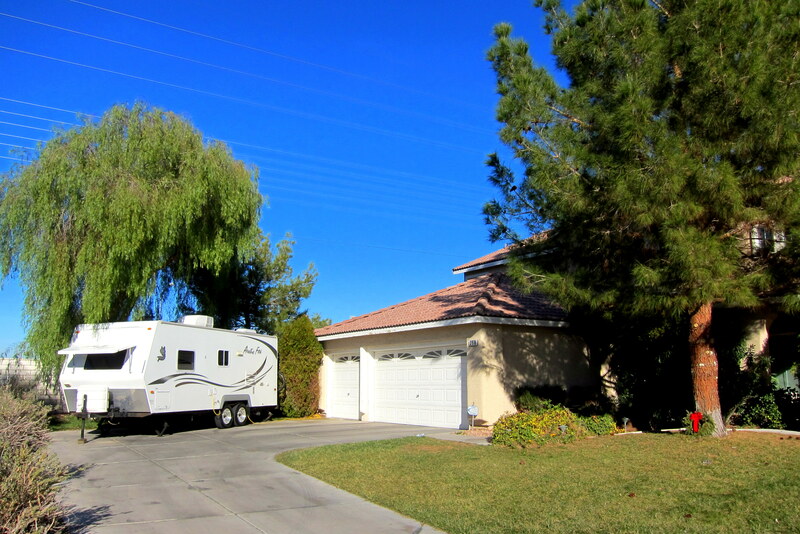 The RV sites are closely spaced but nicely landscaped. And with over 660 sites this park is rarely full which allows spacing out of the RV’s. Which is nice, because it gives the Jack and Tucker plenty of run around and active play room. Many of the days during our stay it was unseasonably cold. 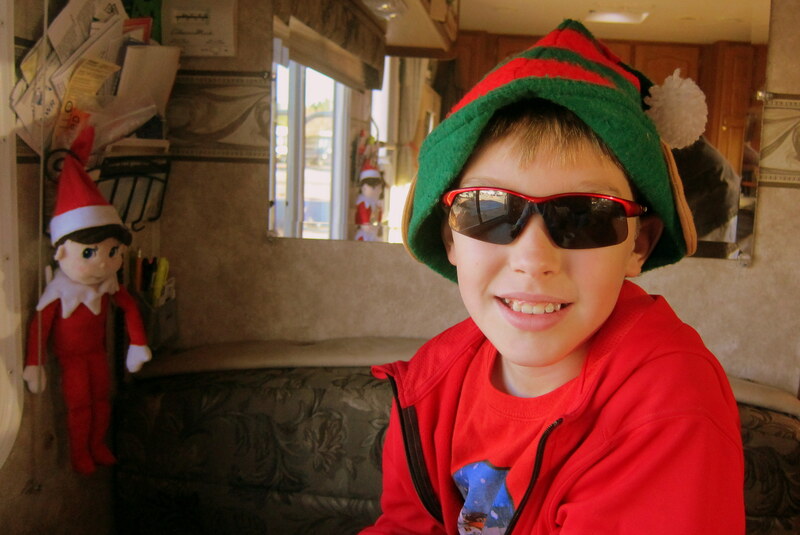 On these occasions, we would take Jack and Tucker shopping or to the movies…..or just spend some eTime in the camper. The exterior of our camper was pretty nasty from our trek across country. 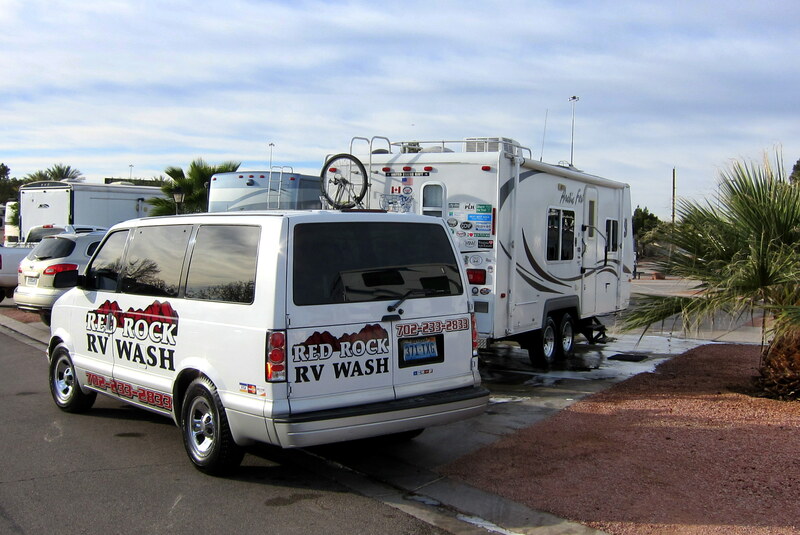 Since this area is still under a drought the only authorized way to get the camper looking good again was by contracting with an RV Detailing service. At $2.00 a foot, the old girl looked like new again…..which is a good thing as we need to get it appraised for trade-in value soon. As mentioned, Las Vegas has been experiencing some unusual cold weather of late, much too cold to swim in the resorts pools. So we kept jack and Tucker busy with other activities such as breakfast at poolside! 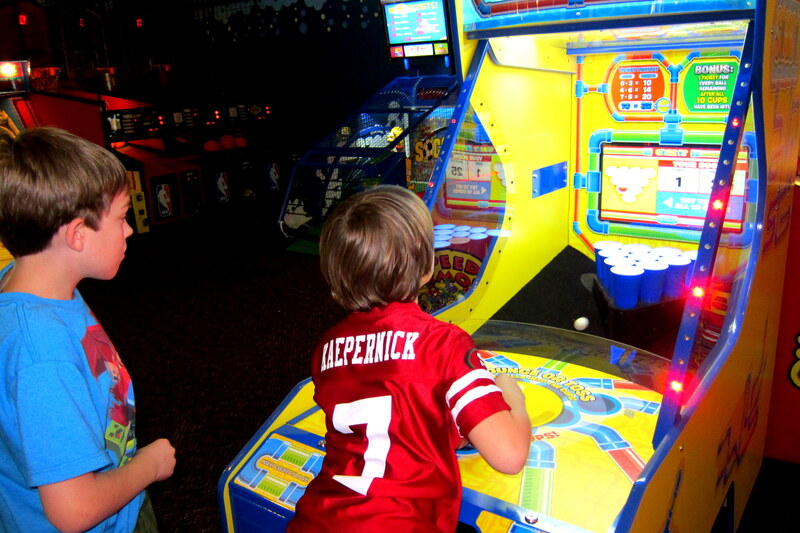 Or learning the fine art of Beer Pong at the local arcade. On one particularly cold day we holed up inside and made Christmas decorations. 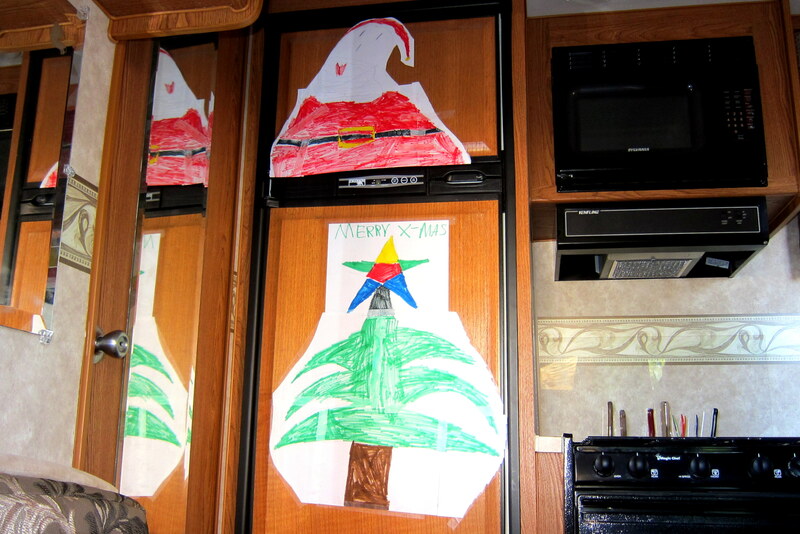 Jack and Tucker made cards for mom and dad and then took to decorating the camper. 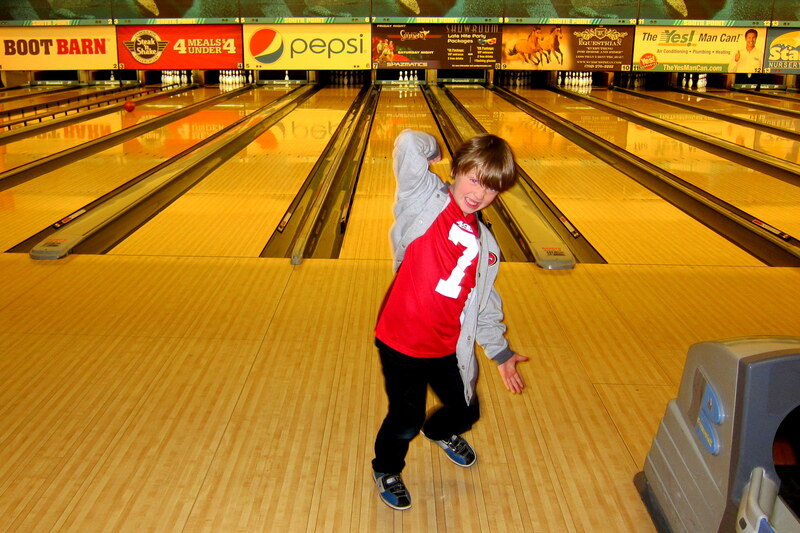 On yet another cold day, we went bowling at the South Point Casino. Upon arriving, Jack took the responsibility of logging us into the electronic scoreboard and intentionally misspelled our names. 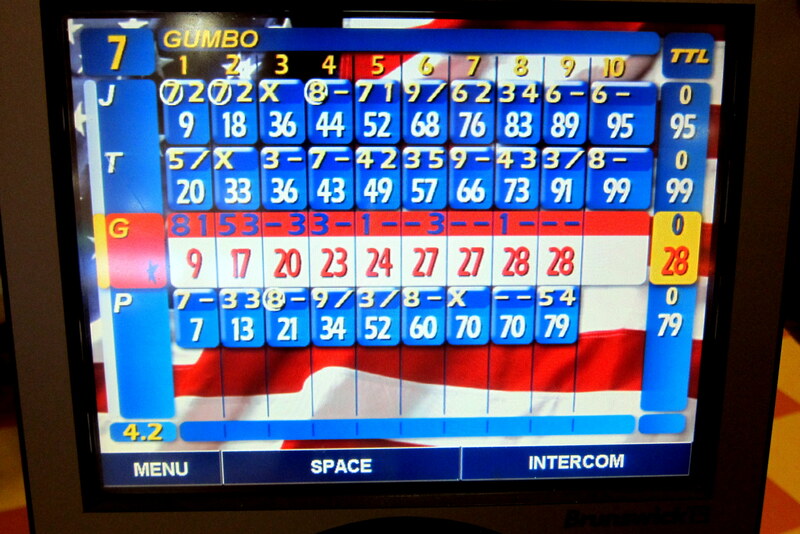 Kit’s name elicited little attention; however whenever my turn at the lane rolled around, the large screen above the foul line would read; ”Now Bowling, Poopy”. 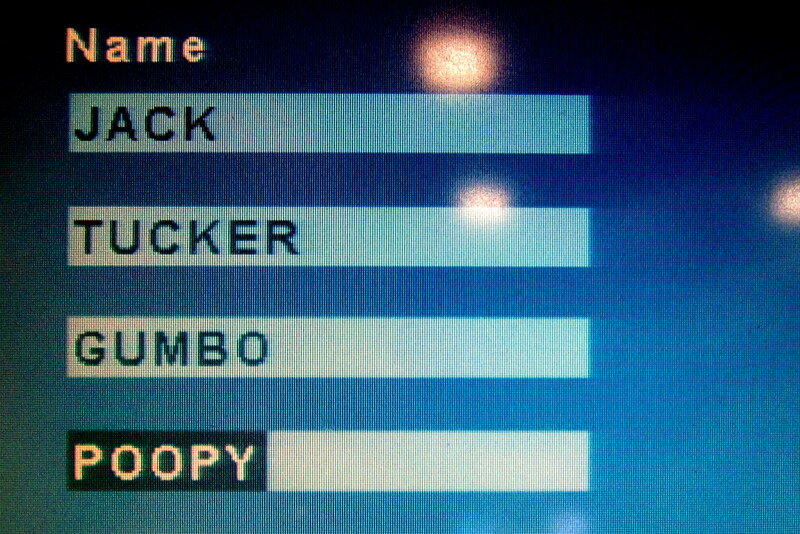 Jack and Tucker would howl with laughter which would attract the attention of neighboring bowlers and scoring (no pun intended) many chuckles. 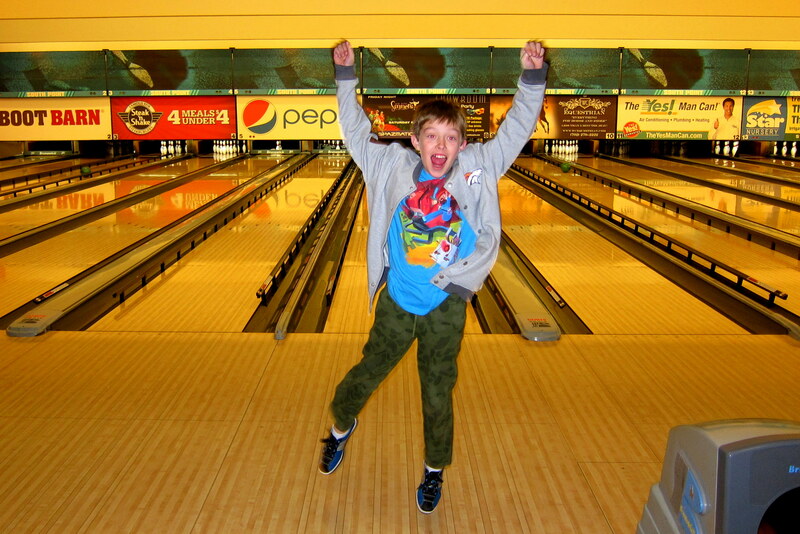 Jack and Tucker took to bowling like old pros…..even scoring a few strikes! 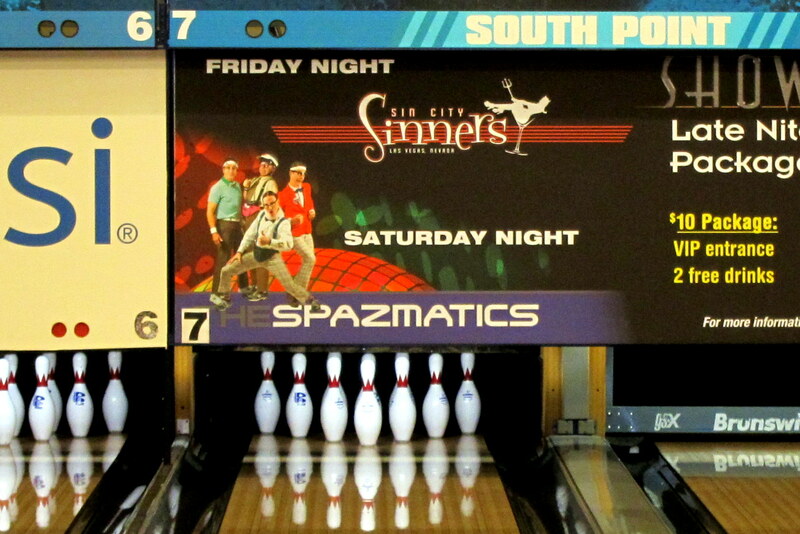 We were bowling on Lane #7, and the sponsor of our lane was appropriate to our bowling prowess. And how did the spazmatics score? Returning to the camper, Jack and Tucker discovered what happens when one buckles their seatbelt before buttoning their jacket. Yep, this actually happened……a great life lesson. THE NATIONAL WEATHER SERVICE IN LAS VEGAS HAS ISSUED A WINTER STORM WATCH WHICH IS IN EFFECT FROM TUESDAY AFTERNOON THROUGH THURSDAY MORNING. SNOW COULD BE STEADIEST AND HEAVIEST IN THE LAS VEGAS VALLEY ON NEW YEAR’S EVE IN THE AFTERNOON AND EVENING HOURS. IMPACTS: TRAVEL COULD BE DIFFICULT IF NOT IMPOSSIBLE. It turns out the “storm’ amounted to some wind and only a few flurries……much to the disappointment of Jack and Tucker. One of the responsibilities we have while hanging out with our two grandchildren is to ensure their proper nutrition as evident by the breakfast I prepared for young Tucker one morning. 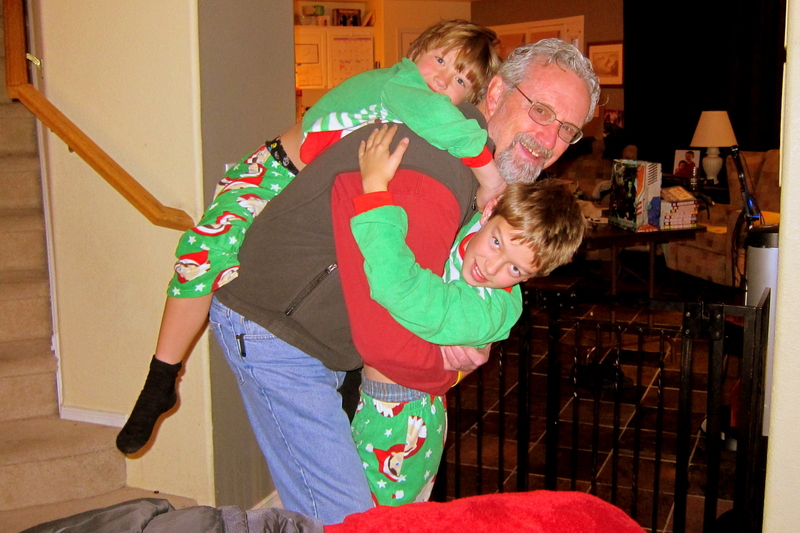 Yep, that’s my job…..spoiling the grandkids…..and business is great!! Jack and Tucker’s personalities have really developed over the past few years. And it is getting increasingly apparent the direction their life is headed…..for example; Tucker will very likely be a musician. 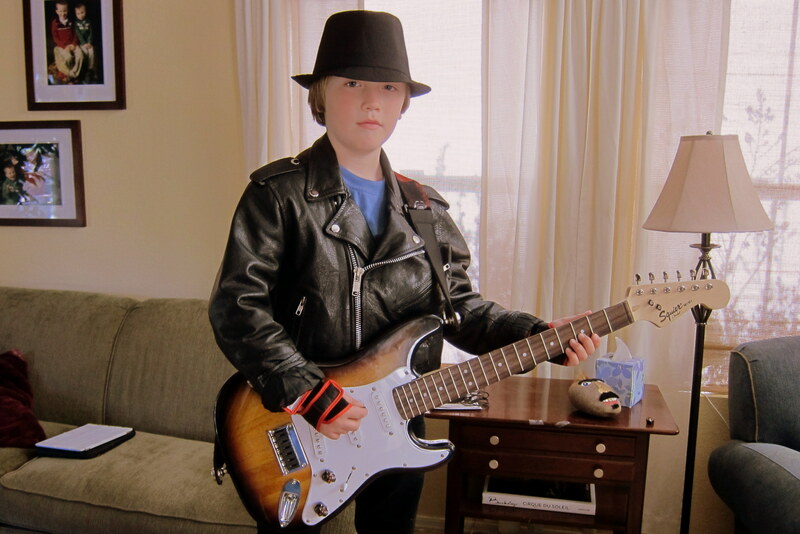 The kid has great taste in music…..one of his favorite artist is Stevie Ray Vaughan! 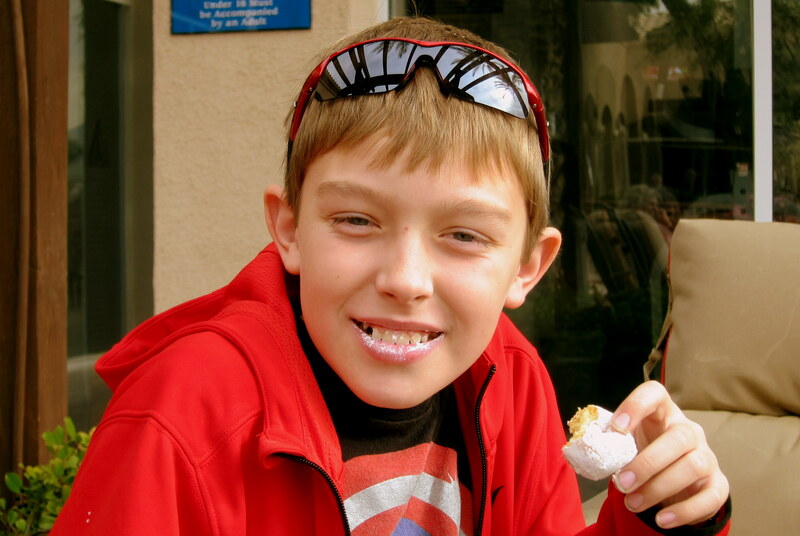 And Jack has a proclivity toward science or engineering. 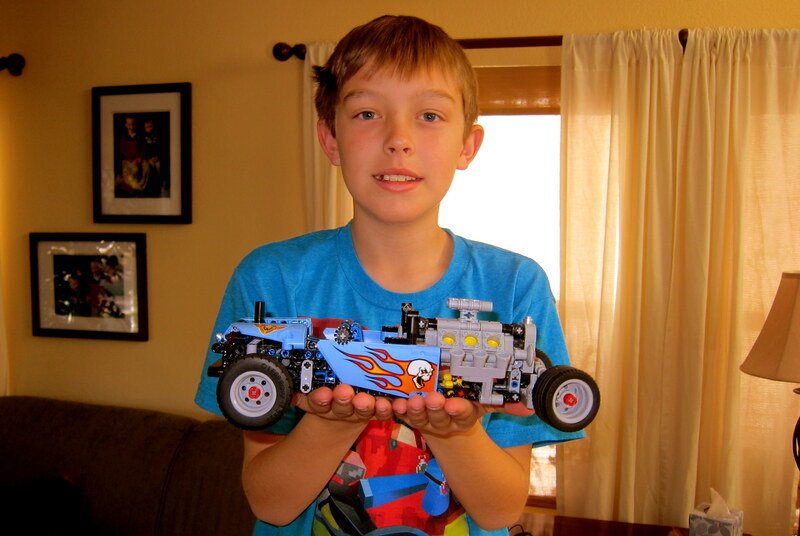 He is very resourceful and creative…..and desires to be a Lego Engineer! 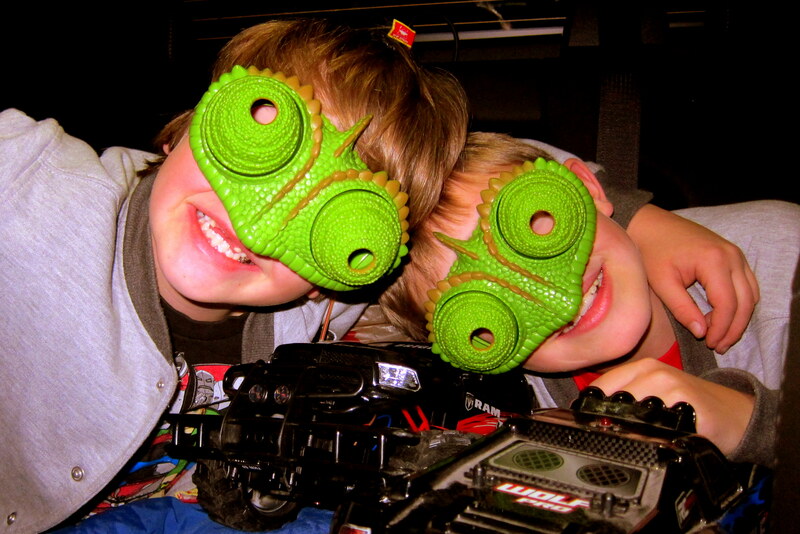 Both kids are very bright, having been accepted in the local Academy of Science Charter School. It will be really interesting to watch them mature into productive citizens. 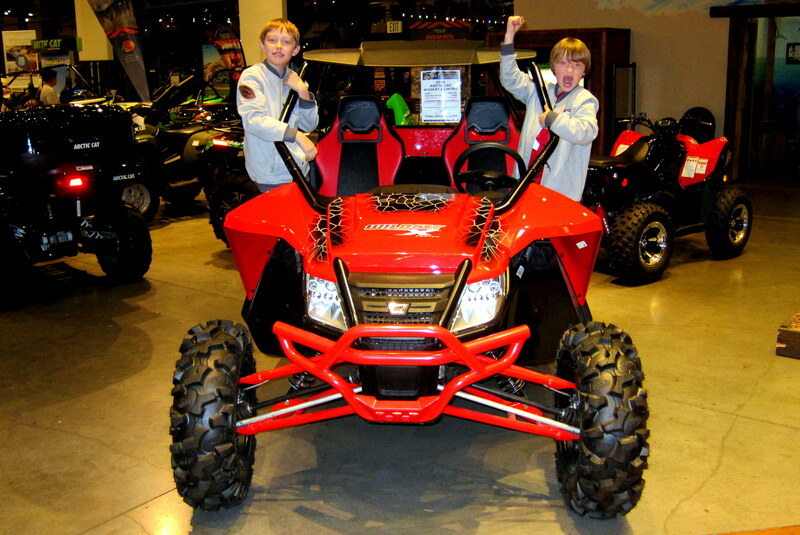 Since it was so cold this year, we looked for indoor activities to entertain Jack and Tucker…..one of which is their favorite indoor amusement park called Bass Pro Shop. Here they can try the various four wheelers on for size. And to select the boat they would like to own in a few years. 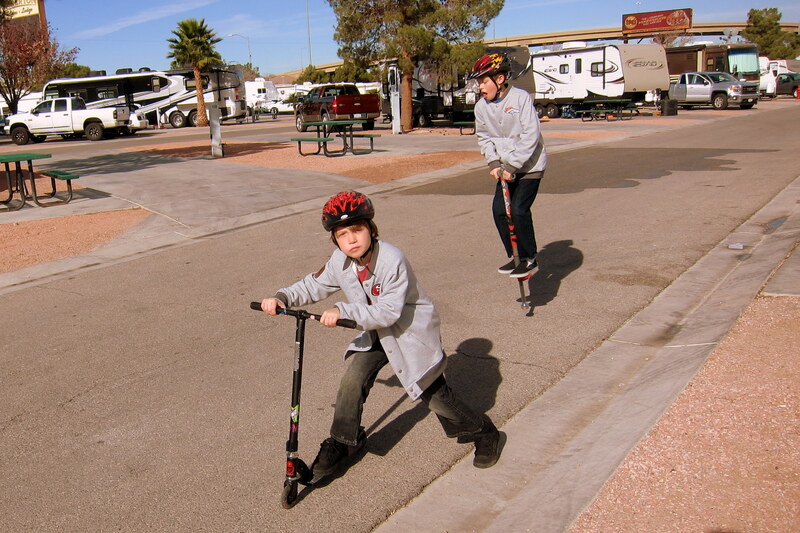 After a great ten days in Las Vegas, our time was up at Oasis RV Park. Our original thought was to head west and hopefully warmer weather. However Suzie and Kevin offered us a spot in their driveway for a few days so we decided to extend our time in Vegas. We spent the final three days in Las Vegas enjoying time with the family. One of our traditions when taking advantage of an opportunity to Driveway Surf is to treat the kind hosts to a nice meal at an area restaurant. 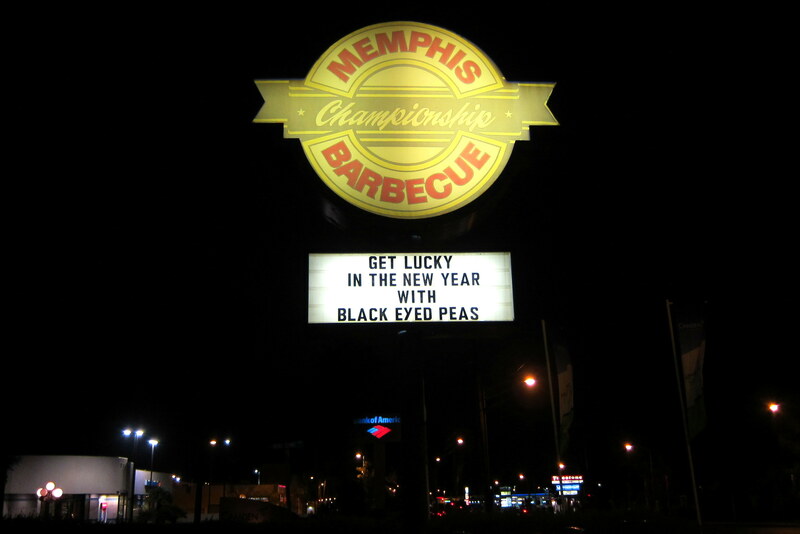 And there is none better in Vegas than Memphis Championship Barbecue! Where we ordered the famed Family Platter and all six of us dug in! Before we leave Vegas, a few words about our great Maine family! 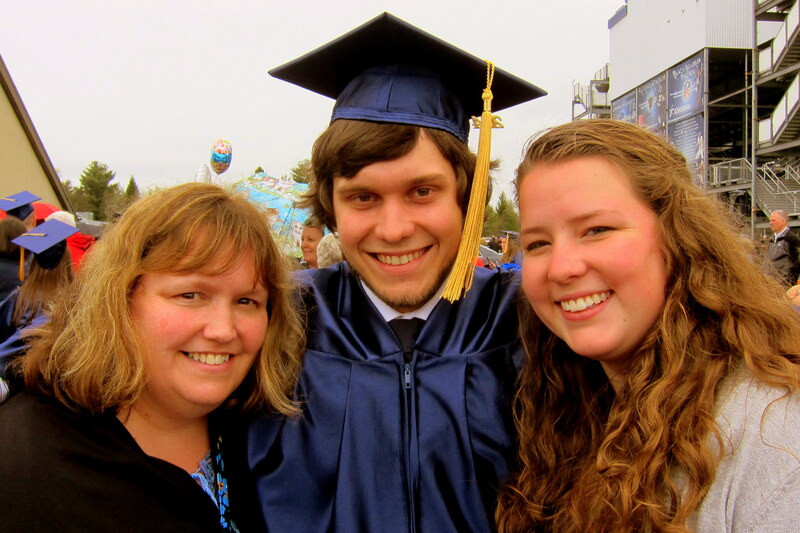 Our oldest grandson, Joe graduated from the University of Maine this past summer, much to the delight of our oldest daughter, Kim and Joe’s adorable girlfriend, Abby. Joe spent the summer on the Penobscot River working as a White Water Rafting guide. 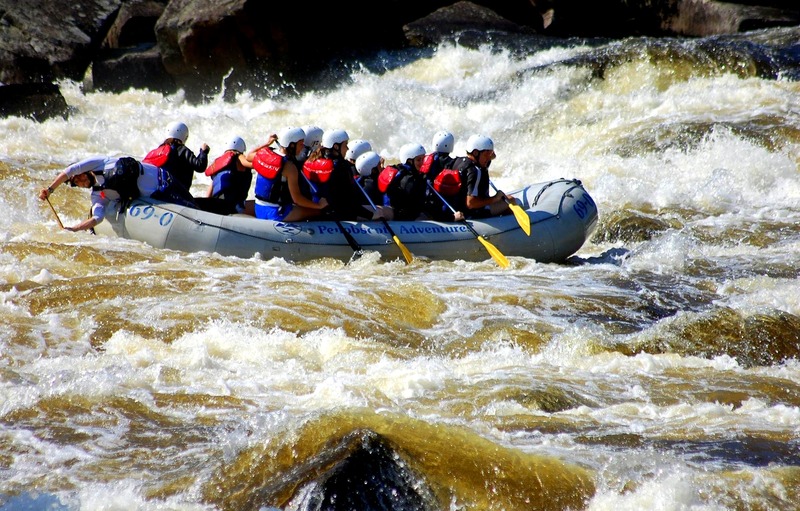 Yep, that’s him leaning off the stern of the raft and steering as they ricochet through the rapids. 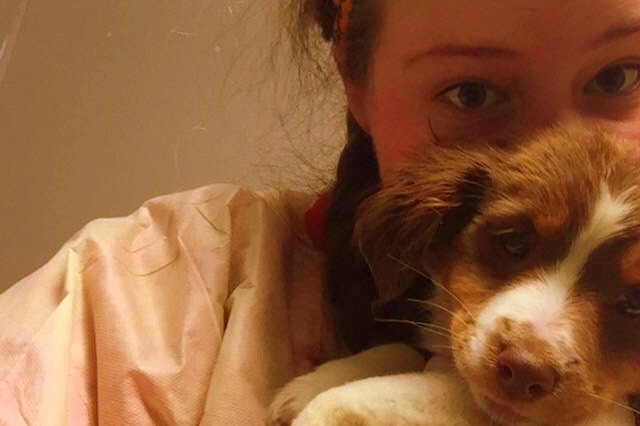 And Abby’s love of animals is a natural fit for her job at the local Humane Society shelter. 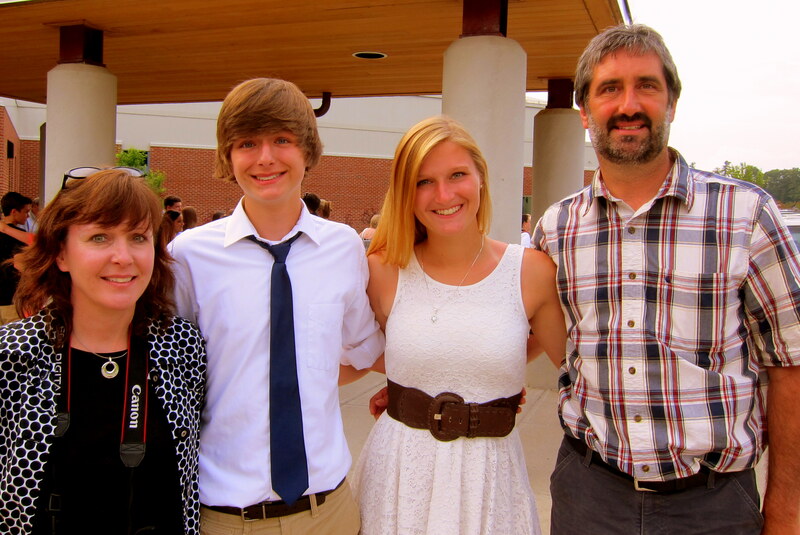 Our son Joe and his family live about an hour away and also celebrated graduations. 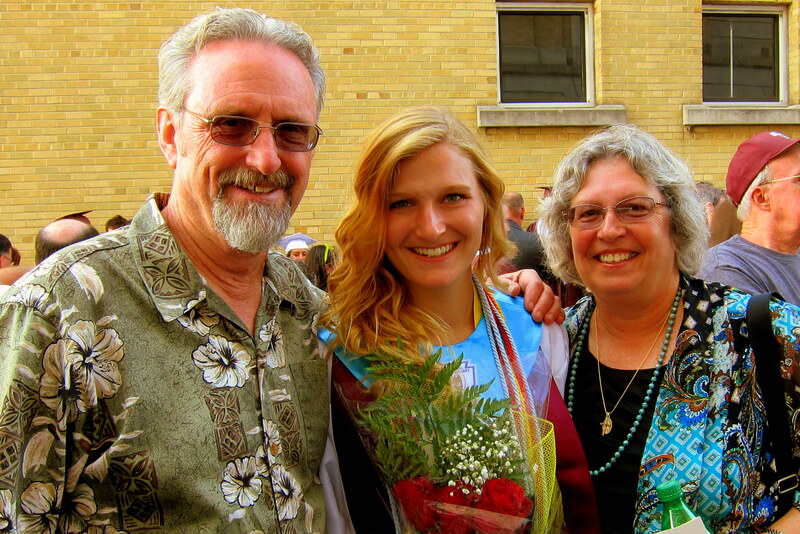 Katie graduated with honors from High School, and as a four letter Varsity athlete was awarded a scholarship to play Lacrosse at an Eastern university. 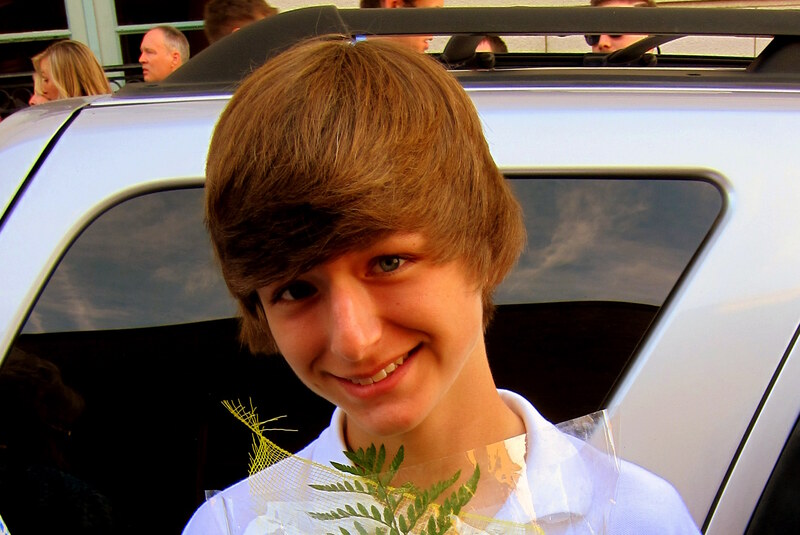 Christopher graduated from Junior High School and is “enjoying” being the center of attention at home. 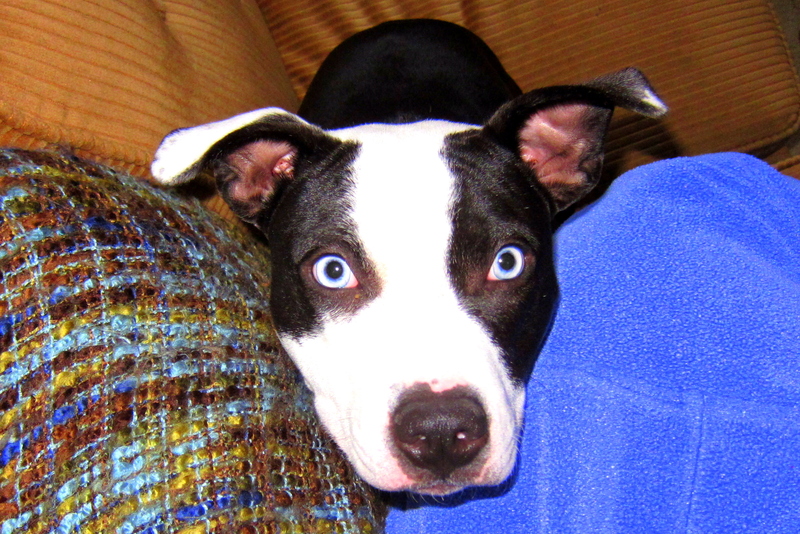 Then there is our great grand-dog, Mosey. She is a beautiful girl and a joy to have around. Notice the white patch on the tip of her left ear? Yep, it forms the shape of a heart…..indicative of her loving and playful nature. Well, it’s time to head for the coast so we say Adios to Las Vegas and Suzie, Kevin, Jack and Tucker. Thanks for everything folks…..we will be back soon! Sunday, January 4, 2015: Leaving the kid’s driveway at 0910 under sunny skies and a temperature of 45 degrees. As a side note, Weather.Com shows the temperature back home in Maine as 45 degrees. Of course they are three hours later in the day…..but really!?!? Kit and I decided to motor south on Las Vegas Boulevard until we connected with Interstate 10 near Sloan, Nevada. There is easy access to “The 15” from where the kids live but the morning drive down the boulevard has been shown to be far more pleasant. Now, if we were headed East, then the interstate would have been preferable to dragging an RV through the heart of the Las Vegas Strip…..don’t ask how I know this! 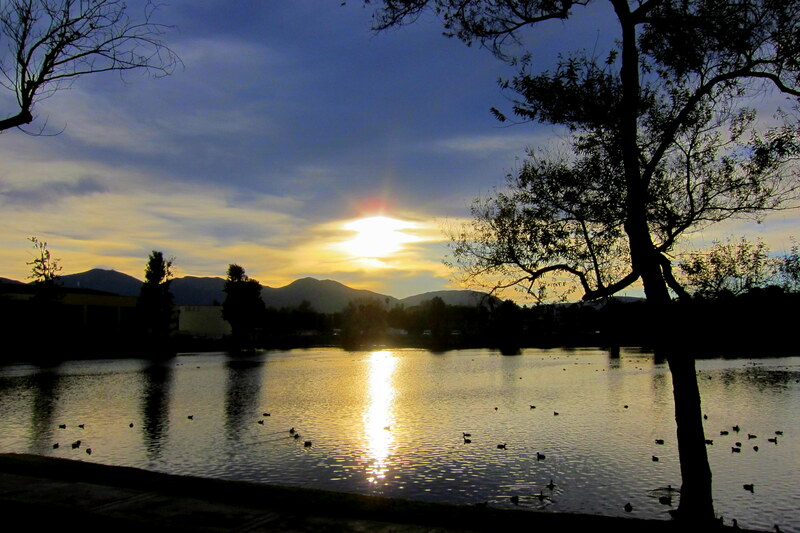 Weather was absolutely perfect for traveling westerly…..at least until the sun starts to set later in the day. As we merged onto I-15, Kit noticed there was a lot of traffic also heading west this morning…..then it hit us! Um, not the actual traffic…..although the way some of those folks were driving it was a wonder there weren’t any mishaps. Nope, what occurred to us is that today is the end of the Christmas holiday and that folks were heading home to California. Usually we avoid traveling on weekends or holidays, and especially holiday weekends. However as retirees we occasionally lose track of what day it is and are perplexed why everyone is on the road the day we want to travel!?!? Even though the speed limit is 70 MPH, I just sit in the right lane and plod along at 60……plenty fast with a 6000 pound tow astern and a speed where our fuel economy is still relatively sane. 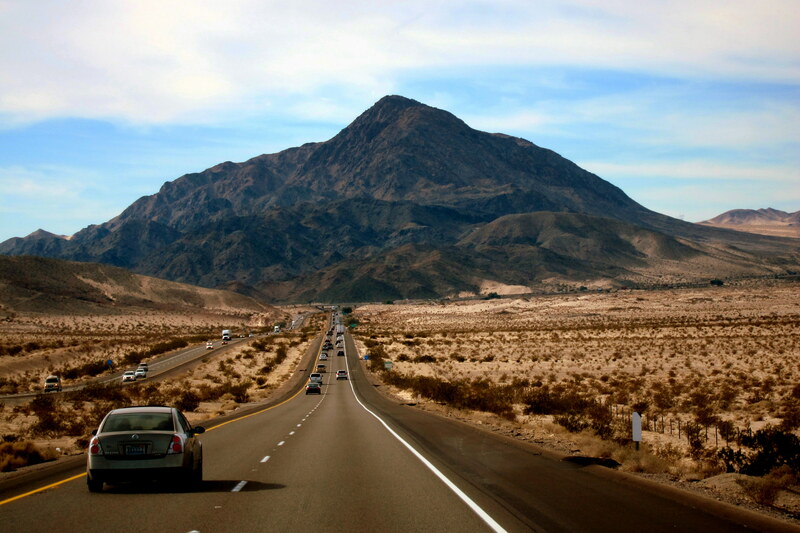 However the long, mostly flat and straight freeway from Vegas to Barstow, California is notorious for speeding. 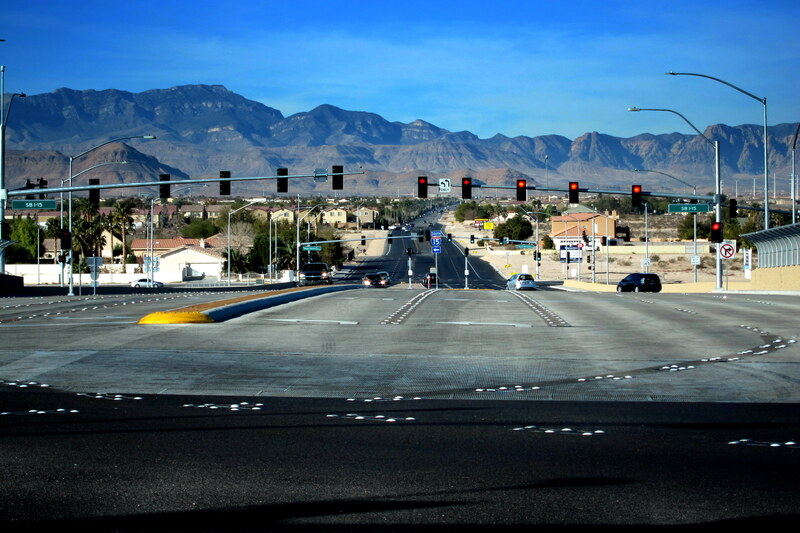 The police call it “The Vegas Itch”, as folks heading to and from Sin City challenge each other in bumping their speed ever higher. According to the Nevada Highway patrol, A Lamborghini was clocked a few years back going 187 mph. The trooper who issued the ticket keeps a framed copy in his office. 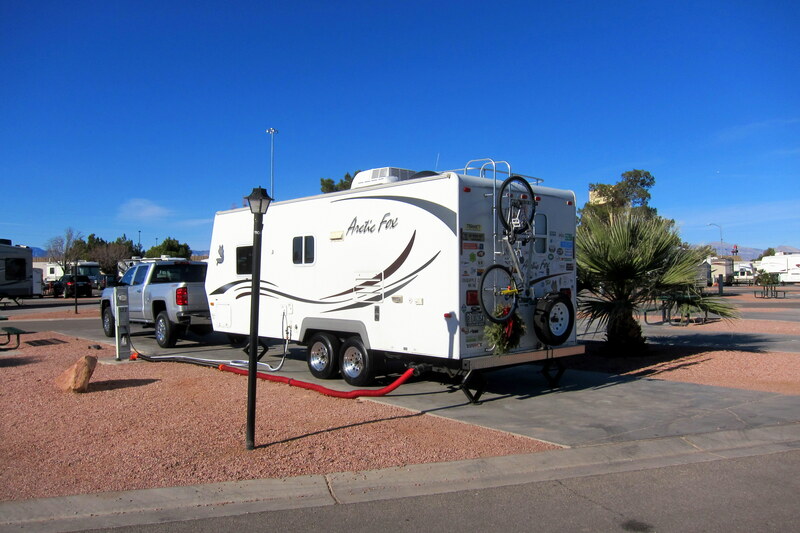 At 1000, Kit and I stopped for breakfast in Primm, Nevada where we enjoyed cereal and coffee in the camper. 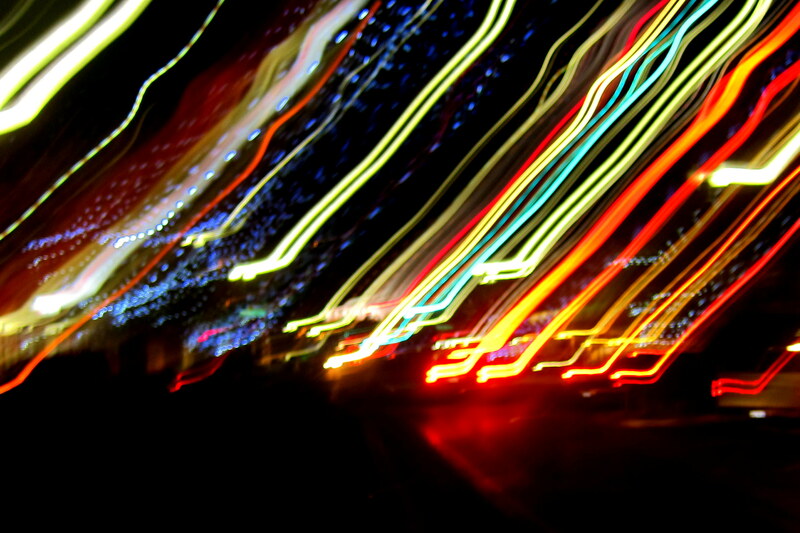 We parked within sight of a number of restaurants surrounding a large casino complex on the Nevada-California border. With our deeply tinted windows, passersby’s had not a clue we were inside enjoying breakfast. Within 30 minutes we were back on the road and immediately crossed over the California border. 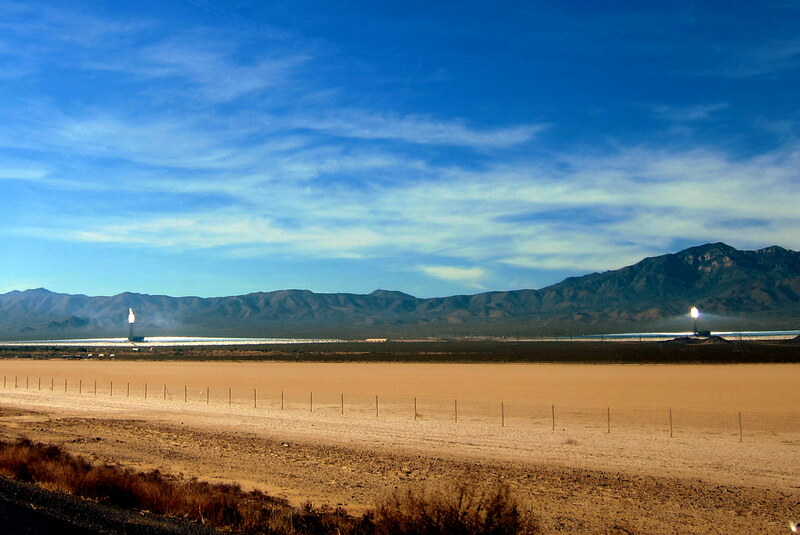 As we motored west, I noticed that there was an additional Solar-Boiler tower that had come online at the Ivanpah Solar Electric Generating complex. The highway through the Mojave Desert of California is relatively uninspiring. It’s almost but not quite as desolate as West Texas. There are a few sights worth detouring for, Mojave National Preserve and Death Valley national Park to name two. Both of which we have explored during earlier Excellent Adventure trips so we just continued on. 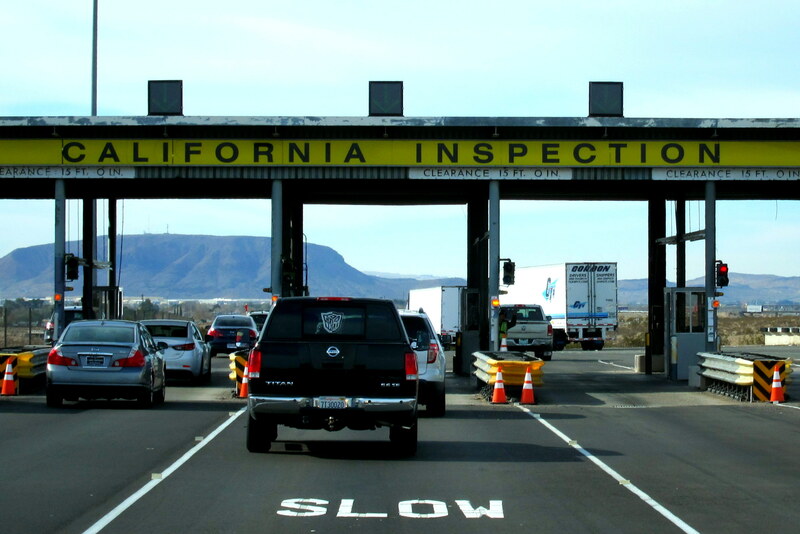 A fair distance into California, we came to one of the state’s Agricultural Inspection Stations. We have come to expect if you’re traveling in an RV you are subject to closer scrutiny whether here or at the Border Patrol Stations. Following the usual questions about any possible fruits and vegetables onboard, and some lite banter with the very pleasant agent, we were allowed to proceed. By midafternoon Kit and I were headed more southerly on I-215 through the town of Riverside before reconnecting with I-15. We soon found ourselves in San Diego County and moved over to California State Highway 52 heading inland to the town of Santee, and our destination for the next few weeks. Pulling into Santee Lakes Campground we noticed a string of unusual lakes shimmering in the waning daylight. Finding our pre-reserved campsite Kit and I set up for our stay and what is sure to be a very interesting and exciting time near our hometown of San Diego. As night fell, we found our way to a friend’s house we had not seen in over 50 years! Our friend JoAnne and her husband Ron are an incredible couple who have been dealing with some unbelievable challenges. Kit and I were overjoyed to reconnect with JoAnne and meet Ron…..much more on them and their lives in an upcoming journal! 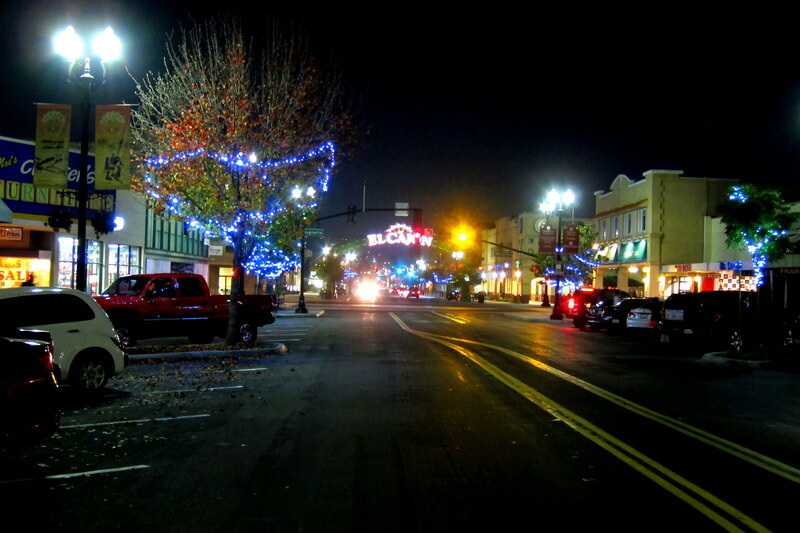 After some visiting and catching up, we all went to the nearby town of El Cajon. 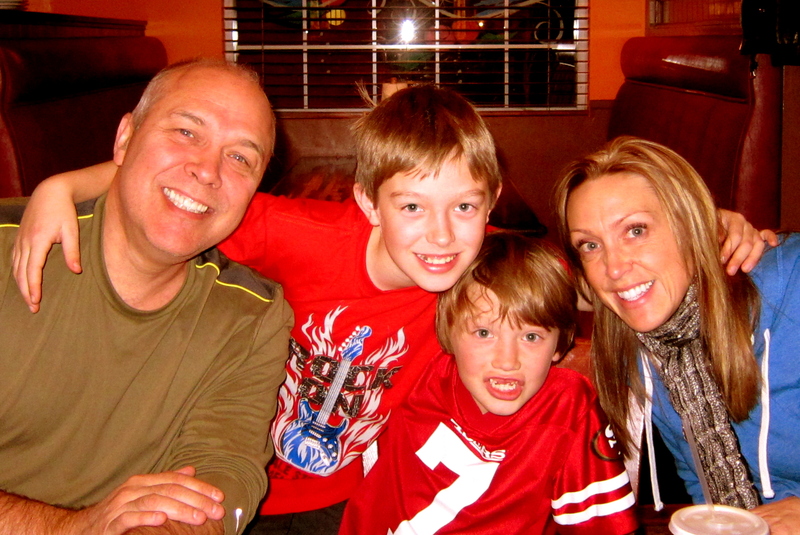 Where we enjoyed a celebratory reunion feast at one of their favorite Mexican restaurants. Then, following a great meal with great company and lubricated by a few very smooth celebratory Margaritas we meandered back onto the street which had taken on a whole new look!?!? Must have been the Patrón! Wait until you hear the story of how Kit, JoAnne and I first met, our history together growing up in San Diego, and how we reconnected after all these years……stay tuned. 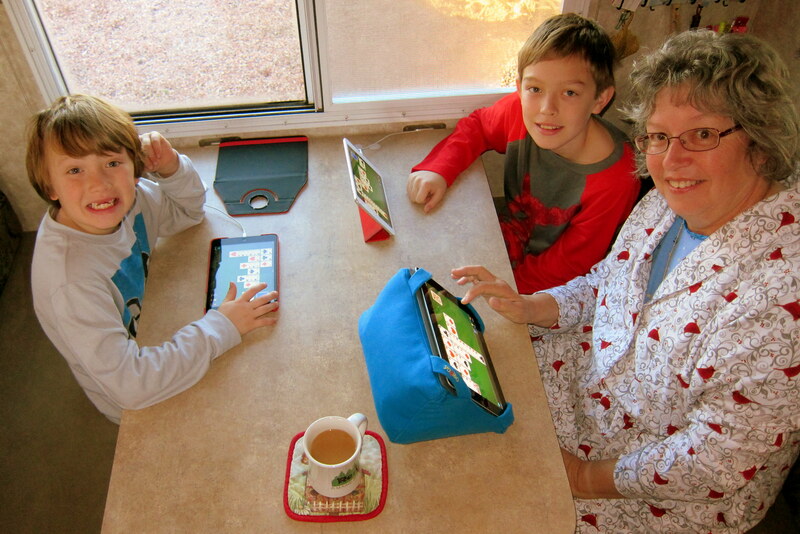 Kit’s Bit’s: Well, despite the unexpected cold snap in Las Vegas, we had a great time with our two youngest grandkids! Since we only see them every six months or so, it’s always amazing to us how much they have grown and matured during such a short time. In fact, since they have both grown so much, they had trouble sleeping in the small dinette, which makes into their sleeping area. They were waking up in the middle of the night, each trying to recover some sleeping space. Sometimes, they even fell out of bed; which felt like an authentic earthquake in our tiny trailer! So, after a few of these unsettled nights, the kids decided they would rather sleep in their own beds at night and spend most of each day with us. It worked out well since all of us was able to get a good night’s sleep! This entry was posted in 2015 Excellent Adventure, Uncategorized. Bookmark the permalink. I can’t believe “Big” Joe has gray hair! Sorry you are missing our blizzard tomorrow—-it builds character…….LOL. I’ll bet the boys will enjoy the roomier accommodations in the camper on the return trip!! Anxious to hear about Kit and JoAnne’s time together after so many years. Continue to enjoy your trip and we’ll enjoy reading about it. Love ❤ you guys! Bill and Kit, You were a couple blocks from our house in El Cajon. 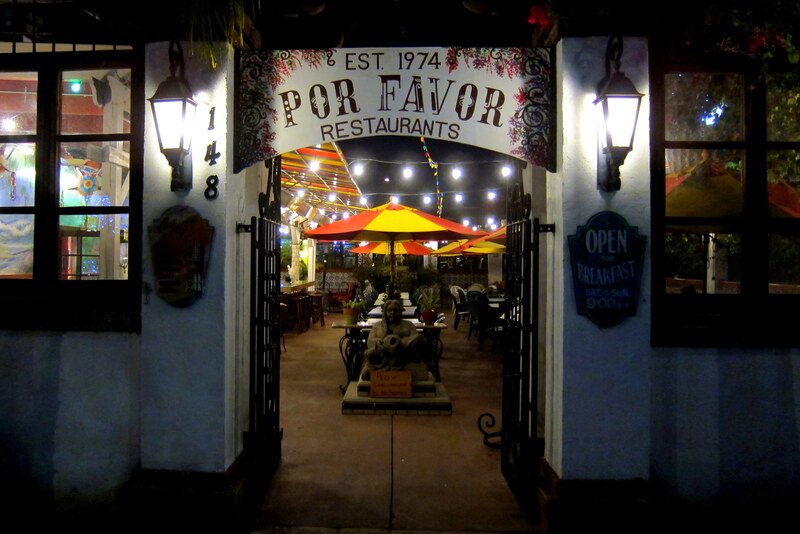 Late spring into summer Por Favor is the place to eat outside on Wednesday evening. 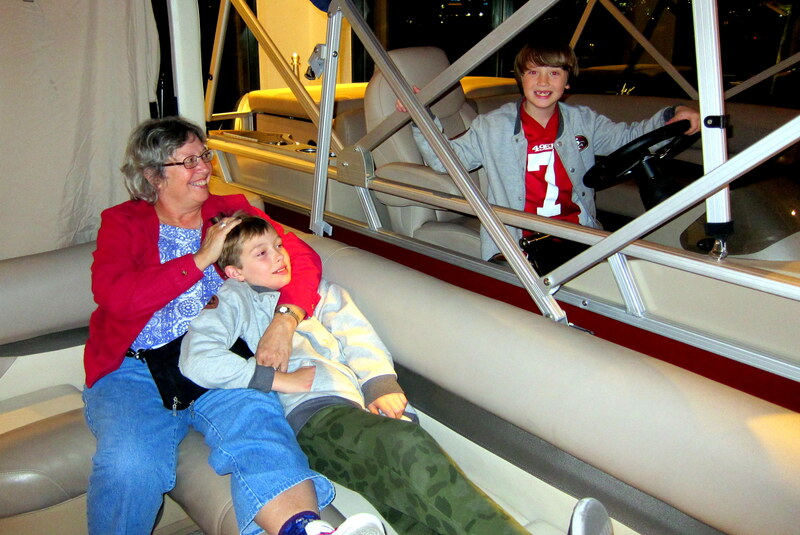 They have cruse night every Wednesday night We have also stayed at Santee Lakes. If you are still I the area give us a call. Love armchair traveling with you guys and the pictures. Enjoy your time in San Diego, looking forward to your next journal and new adventures…..have fun enjoy the balmy weather. WELL IT’S ABOUT TEN DEGREES AND WINDS AT 50 PLUS MPH AS I TYPE, WITH AT LEAST 5 DEGREES BELOW ZERO WIND CHILL. THE BLIZZARD OF 2015 IS IN FULL FORCE AND RIGHT NOW WE HAVE ABOUT 14 INCHES OF FLUFFY STUFF..KIM IN BEVERLY MA. HAS TWO FEET. I HAPPENED TO BREAK AN ANKLE WHILE DUCK HUNTING IN MA. LAST WEEK, SO JEANNE IS PULLING DOUBLE DUTY. SURE LOOKED AND SOUNDED LIKE YOU HAD A GREAT TIME WITH THE FAMILY IN VEGAS..
WE ARE SOME THANKFUL FOR HAVING INVESTED IN THE PROPANE AUTO GENERATOR. NO POWER OUTAGES AS YET, BUT YA NEVER KNOW. SOME IN THE STATE HAVE BEEN OUT FOR A WHILE NOW AND MIGHT BE FOR DAYS.. I SUSPECT THAT YOU SHOULD BE PICKING UP THE NEW CAMPER ANY DAY NOW, LOOKING FORWARD TO SEEING THAT BIG GRIN ON KITS FACE. SPOKE WITH NANCY THIS MORNING, THEY ARE WARM AND SAFE. SORRY YOU HAD TO MISS THIS HISTORIC EVENT, MAY NOT BE ANOTHER FOR 500 YEARS. BE SAFE AND GOOD HEALTH.